Week 2 – Are you ready to join me for a year of self-care? Over the last two weeks I’ve been having fun creating videos, worksheets, resource lists, and new tools as part of an upgrade to the online course I developed for Hay House a couple of years ago based on The Art of Extreme Self Care. I specifically designed the course to mirror the way I wrote the book, with the intention to make one behavior change a month, because it’s easier, more realistic, and it supports long-lasting success. And now we’re ready to launch this morning and I’m happy to let you know about it. This course is important to me because self-care is good for the planet. From years of personal experience, as well as coaching great men and women, I’ve come to understand that when we care deeply for ourselves, we naturally begin to care for others – our families, our friends, our greater global community, and the environment – in a healthier and more effective way. We tell the truth. We make choices from love instead of guilt and obligation. And we soon realize that we’re all connected and that our individual actions affect a greater whole. To that end, information about this yearlong course will become available through Hay House today and if you’d like to join me this year, I invite you to watch the first video. You can access it here. The course itself will start on January 18th at 7pm EST/4pm PST and I’ll be hosting a live lesson where I can take your calls and help set you up for success. If you’ve already taken took the course with me, I have good news. You’ll have access to all the additional tools I’ve created without having to pay anything more. Hay House will send an email to you with instructions on how to access the new material. And if the course isn’t right for you at this time, please be sure to watch the videos I recorded anyway because I share three self-care strategies that I use in my life right now to keep myself aligned with what matters. They’ve been enormously helpful and I want you to benefit from them as well. 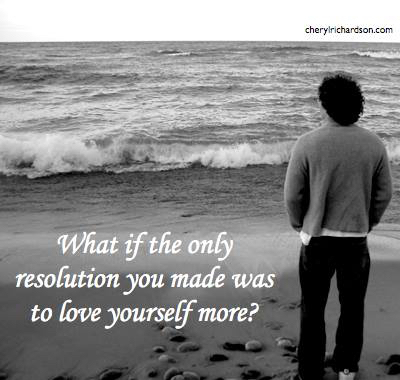 A commitment to loving ourselves more is always a great resolution for the New Year. With this in mind, I invite you to download the graphic below and keep it in view. It’s been such a helpful reminder to me, especially during tough times, and I’m sure it will help you as well. Here’s to even better self-care in the New Year! The “Art of Extreme Self Care” videos can be accessed by signing up here. Here’s one of the new videos I made to support you in practicing a very important act of self-care: Getting good sleep. You can watch it here.